The houses at 21st (right) and R Streets, NW in 1887. 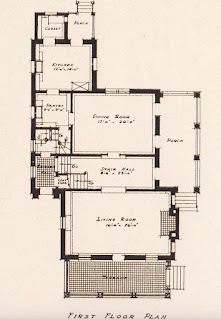 Washington, D.C. residents are fortunate to have original building permits for most of the structures in this city built after 1877, when they were first required, but sadly, the vast majority of the accompanying drawings to these records were destroyed by the city government in the 1960s. It is always a rare occasion to obtain a detailed artist orarchitects rendering of a planned residential development, such as that above of the row of houses located on R Street between 20th and 21st Street, NW. They were built following a building permit that was issued on June 17, 1886, and remain to this day. The permit listed owner Brainard H. Warner as owner of the lots and builder of the eleven houses that were to be constructed between 2006 and 2028 R Street at a cost of $77,000 or approximately $7,000 each; a substantial sum for the time. 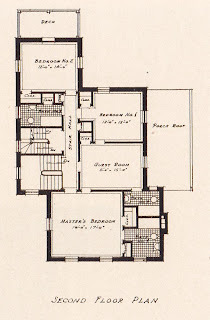 He listed architect W. F. Weber from Baltimore as responsible for the design of the houses, which were to be constructed of brick, marble, and brownstone atop a concrete foundation. Warner listed his address as 2100 Massachusetts at the time of his application to build the houses. It was a house that he had built himself just two years earlier, in 1884. He would remain at that address throughout his building and finance career in the city, overseeing the construction of more than one thousand houses under the guise of the B. H. Warner & Co business. Warner had been born in Great Bend (now Halstead) Pennsylvania, in 1847, and had served in the Army until accepting an appointment at the U.S. Treasury in 1866. Upon his 1872 graduation from The George Washington University Law School, Warner joined the real estate firm of Joshua Whitney & Co. He later succeeded the owner following his death, and constructed the Warner building in 1876, signaling the beginning of a rather substantial yet undocumented construction career. Logan Circle residents who find themselves washing their cars religiously at the car wash and laundromat on the southwest corner of 11th Street and Rhode Island Avenue may experience a sense of deja vue, as it was once the site of the elegant Northminster Presbyterian Church. The building featured a corner entrance facing the intersection, with a shortened square tower and large balustrades above. It was built at a cost of $75,000 following a building permit that was issued on October 1, 1907. With the address of 1100 Rhode Island Avenue, the church was formally dedicated in the spring of 1908, when it had 209 members. The congregation was organized in 1906 as a result of a merger of the old North and the Assembly Presbyterian congregation. 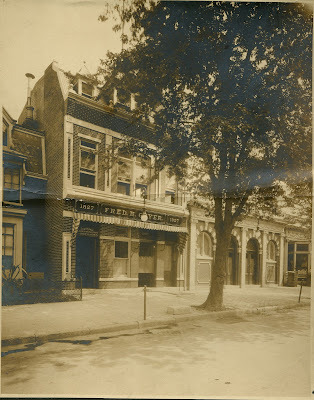 The Northminster church facility would have ties to a home on the same block, at 1120 Rhode Island Avenue, until the church building suffered a disastrous fire in 1935. The home at 1120 RI Ave was built in 1895 for Dr. Frederic Maxcy, an employee of the Marine Hospital on Capitol Hill, who also had a practice at the house until his death about 1908. It was purchased in 1920 by Frank M. and Ella M. Thompson; she having been a teacher at the Northminster Church Sunday school since its opening in 1908. Mrs. Thompson had succeeded her husband as the President of the Iowa Circle Citizen’s Association in 1921 (later known as the Logan Circle Citizen’s Association). At the time of her election, she was the first woman in the city to hold such an office, according to a newspaper account that appeared in The Washington Star on May 30, 1949. Many Washingtonians know of various hospitals located in the city, either converted into residential uses or razed all together. Unless you were around in the 1990s when it was an abandoned shell, you might not know about the large and modern Children’s Hospital that was once located just north of the U Street corridor on what is today Harrison Square, a whole city block of somewhat newly completed townhouses bordered by 12th, 13th, V and W Streets (Square 272). I had a great time researching it for my book Greater U Street and purchased a rare book that contained these images published shortly after it was opened. The idea for a Children’s Hospital in Washington began in 1869, when Dr. S. C. Busey of the Columbia Hospital Dispensary and other recognized that diseases of infancy and childhood were not adequately being addresses in area hospitals. Thus, on December 2, 1870, the “Children’s Hospital of the District of Columbia” was incorporated and located in a small building at 13th and F Street, with only 12 beds. In 1872, a larger facility was rented on E Street, as plans were being made to purchase a suitable site for a large facility. The Board of Directors purchased the entire Square 272 in 1875 for $15,722.88, or just 16 cents a square foot. At the time, it was located at the edge of the city, just inside Boundary Street, today renamed Florida Avenue. Directors went to work raising funds for the construction of the Hospital in stages, the first building being ready for occupancy the same year of the land purchase, in 1875. Just three years later, the building was expanded to the east and west, and in 1890 with larger wing expansion and an enlargement of the central building, to form its final design pictured here. The building cost a total of $23,662.22. It was designed by John C. Harkness “one of the most experienced and reliable architects and builders of this city,” and built by contractor J. G. Naylor. The original Board of Directors had interested a Dr. James Crowdhill Hall to serve on its Board, and he would eventually give a total of $76,395 toward the effort in an era when a four-story brick townhouse could be built in Washington for $3,500. In fact, Dr, Hall was apparently living so well that he was tried by the Medical Association in 1850 for neglecting to send bills for professional services! His long career was distinguished by serving as the physician to every President from Jackson to the death of Lincoln’s son Robert Todd Lincoln. During the first ten months of operation, the Hospital served 94 patients of both black and white racial backgrounds, as stated in their charter. Once admitted, however, the patients were separated by race, but attended to by white rotating nurses serving both wings of the facility. In 1879, the Hospital Administrators determined that the actual expense of operating and maintaining the facility came out to a little less than 41 cents per day, with an average of 31 patients. During the first 16 years of the Hospital, 20,862 children were treated and provided for and “70 per cent were cured or improved in health.” The backyard of the Hospital featured a large expansive lawn that faced 12th Street, and featured a large wooden gazebo for outdoor relaxation and refreshment. 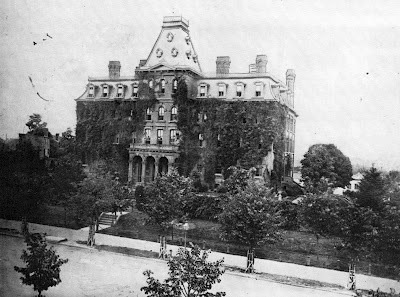 Another history mystery solved in today’s entry, but this case was far easier than one a few days ago on the missing Cassidy House – but who would have thought a simple photograph might lead to a stolen car and the CIA? The photograph purchased online indicated that it was the home of Frank S. Bright when it was pictured in a 1920s edition of Architecture magazine. 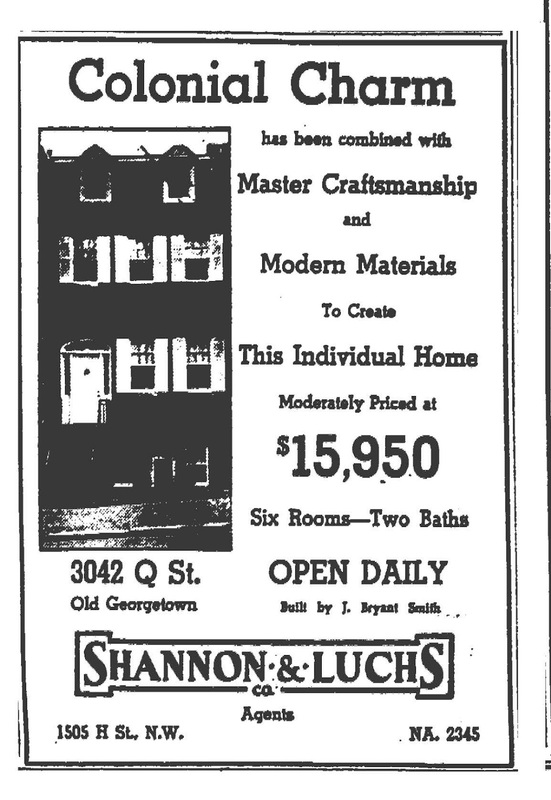 A quick reference to our City Directory of 1925 revealed that he resided at 2723 Q Street, NW in Georgetown, and that the house looks much the same as it does today (right). Driving by the house, one might tend to think that it dated from the 1790s in size and form, but that is not the case. It was built beginning in June of 1922 at a cost of $27,500, a substantial sum for the time. It was designed by architect Delos H. Smith for a lawyer named Frank Steele Bright. 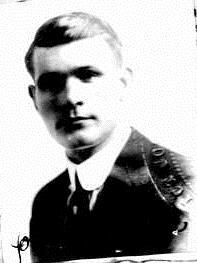 Bright had been born in Madison, Indiana on March 10, 1864; his father, Richard J. 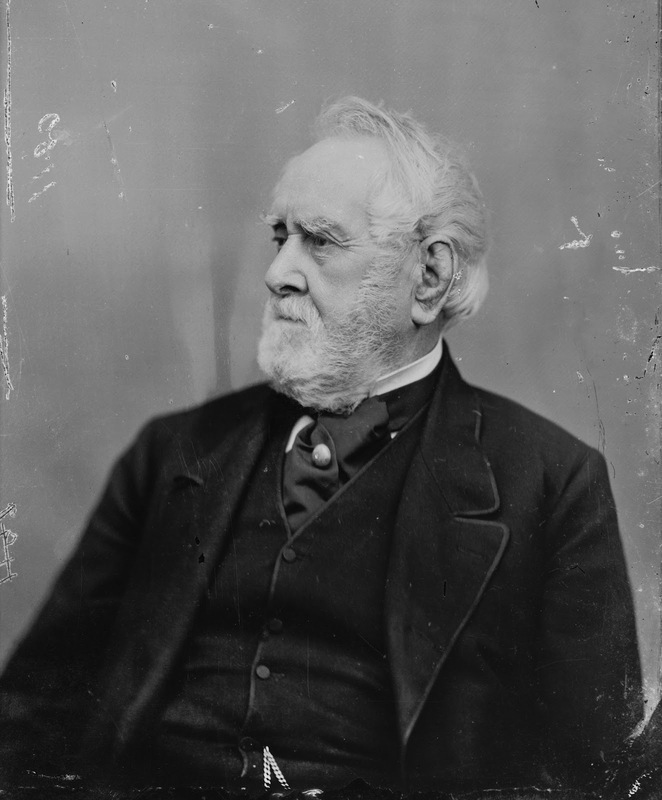 Bright, served as the sergeant at arms of the Senate during both Cleveland administrations, and like many in those days, he appointed his son Frank as his clerk. He suffered a breakdown due to “overwork” in 1935, and retired. He died in 1942 while visiting Baltimore. The Q Street house was sold to Allen Welsh Dulles (1893-1969), and of course your next question is Dulles - How does he fit into the prominent family who has an airport named after them? He was the younger brother of the secretary of State John Foster Dulles. Allen Dulles was an American diplomat, lawyer, banker, and public official who became the first civilian and the longest-serving Director of Central Intelligence from 1953 to 1961. Allen Dulles’ wife, appropriately named Clover given the era, dropped off their 1955 Pontiac at a Georgetown garage to be cleaned on November 4, 1961, and it wasn’t found until a month later when a CIA employee drove it up the driveway in December of that year. It turns out that a car thief named George K. Strasser had stolen the CIA Chief’s car from the street parking near the garage that day, and drove it to Long Island. He was then age 19, and listed an address of 3507 T Street, NW, and pleaded guilty when he was located by the CIA. He worked for the same garage, which likely led to an easy case by the CIA to find the Chief’s car. 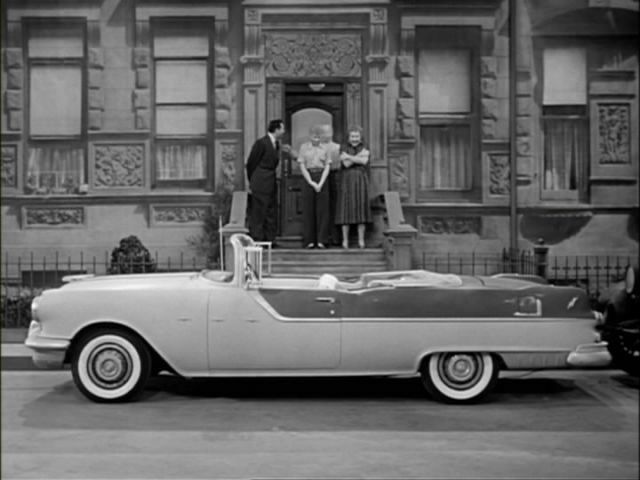 Asleep in the passenger seat next to him at the time of the arrest was Herbert P. Campbell, then age 21, who lived at 4529 MacArthur Boulevard, NW. He maintained his innocence that he did not know the car was stolen, but a jury on January 31, 1962 took just 12 minutes to find him guilty. Strasser had earlier received probation. 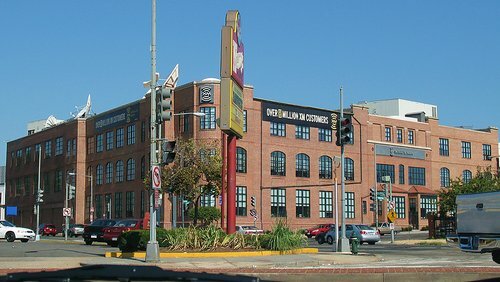 The large building that houses XM Satellite Radio at the intersection of Florida Avenue and Eckington Place, NE, is passed by thousands of Washingtonians everyday on their way in and out of the city along New York Avenue, likely without knowing that it was once one of the largest printing plants in the United States. In fact, if you have a vintage National Geographic magazine lying about, it is likely it was printed at this plant. The printing firm responsible for its construction was named Judd & Detweiler, which was established in 1868 by John Gough Judd and Frederick May Detweiler. Originally from Pennsylvania, they were first located on the third floor of 517 7th Street, NW, where their first printing job that year involved 5,000 blank forms for the U.S. Supreme Court. 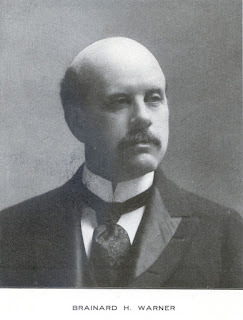 The firm prospered, and by 1883, they moved into a handsome building at 420 11th Street, NW, when they were joined by their sons George H. Judd (then only 16) and Fred F. and George H. Detweiler (below). They then printed such books as a 1,879 page tome on the origins of the Smithsonian that was hand set in type, letter by letter, as the Linotype machine was not invented until 1886. Founder Frederick M. Detweiler married his second wife Nellie in 1894, when he was 64 and she was just 33. In fact, she was five years younger than her stepson, Frederick F., who had been born in May of 1857 in Washington. They all lived at 504 I Street, NW. In 1893, Fred Jr. ventured into the real estate business when he obtained a building permit to build 18 houses between 2701 and 2735 P Street in Georgetown, designed by George S. Cooper. They were not completed, however, until about 1903, due to the economic depression of 1893. Judd & Detweiler began printing the National Geographic magazine in 1896, when it had a circulation of just 5,000. By 1926, the firm was producing over 80,000 copies of various magazines per day; National Geographic alone then had a monthly subscription of nearly 1 million issues that required almost ten days of press time. The firm also printed monthly magazines for the Red Cross and the Daughters of the American Revolution, in addition to the printing needs of the Supreme Court and other government agencies. Many hotel menus and books of the era were also proudly printed at the Eckington plant. George H. Judd and his son, George E., were avid hunters and outdoorsmen, who along with Sam Sours, proposed and lobbied for the creation of the Shenandoah National Park beginning in 1927. 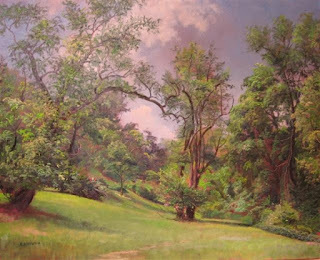 They had been spending summers there at their country house in Skyland since 1898. Locally, for decades, Palm Sunday was coined “Judd & Detweiler Day” at Calvary Baptist Church at 8th and H Streets, NW, as officers and employees of the company took part in special services. George E. Judd, grandson of the founder, took over as President of the company in 1928. The firm lost the National Geographic contract in 1957, when they could not produce the 2,250,000 monthly issues in color. They later obtained color web-offset presses and were pleased to print The White House book in 1962 as their first color document, a record of Jacqueline Kennedy’s restoration of the President’s residence. The building at 1500 Eckington Place was added onto several times, the last being in 1972, to accommodate several large presses and storage areas. By 1986, the company had built large plants in both Maryland and Virginia, and the Eckington facility closed after 117 years in business in the city. At the time, 200 employees worked in the 300,000 s.f. facility. It was acquired by Perry Graphic in 1997, and is today a subsidiary known as Perry Judd’s Incorporated. In July 2000, after a 14 month renovation, the former printing plant became the headquarters for XM Satellite Radio, the largest state-of-the-art broadcast complex of its kind in the U.S., with 82 all-digital studios. An emerging force in broadcasting, it was incorporated in 1992 and has been publicly traded on the NASDAQ exchange since October 5, 1999. History Mystery Solved: Where in DC is this House? The History Mystery House: Where in Washington is it? This entry on a history mystery house was a tough case to crack. 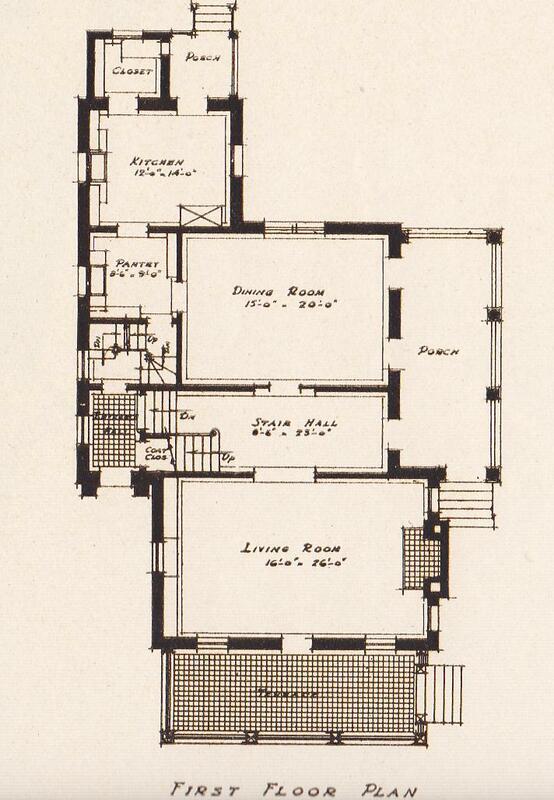 I obtained the pictures of a stone house located somewhere in Washington, DC from an online auction that originally appeared on a single page of the August 23, 1923 edition of Architectural Forum. The only clue I had was that it was the home of Charles J. Cassidy, Esq. Normally that would result in a rather easy investigation into the City Directories about the time the magazine was published. The problem was that two different addresses we found for Cassidy no longer existed: First, 3821 Michigan Avenue, NE and then later, 1063 Michigan Avenue, NE, somewhere near Perry Street. So, I turned to researching a bit more about Cassidy. His obituary on January 1, 1941 revealed that he had been born about 1870 in Washington, DC. He died at home of a heart attack at 1063 Michigan Avenue, one of those addresses that no longer existed. His obit did reveal that he had constructed the Mullen memorial Library and Science Building at Catholic University, and the Chapel and Refectory Building at Trinity College. A quick check with our Ancestry.com subscription confirmed his birth date of January 16, 1870; he married his first wife Grace Miller about 1911, but she died just 7 years later, in 1918. He married his second wife Augusta Braun, 30 years his junior, about 1927. His full name was Charles Joseph Cassidy, and he was buried in Mount Olivet Cemetery. His tombstone appears below. While most of the focus of the 2012 Presidential inaugural will be aimed towards the White House, another white house in Washington also has its fair share of history; the official residence for the Vice President of the United States. Countless commuters travel by its location on Observatory Circle, noted by the curving of Massachusetts Avenue as it approaches Wisconsin Avenue, NW, without the fanfair awarded to 1600 Pennsylvania Avenue. 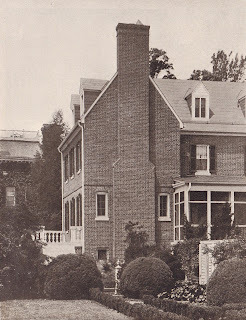 The white brick Vice Presidential house was completed in 1893. The current VP residence stands on what was a working form in the country when it was purchased by Cornelius and Margaret Barber from Brooke Mackall in 1834. 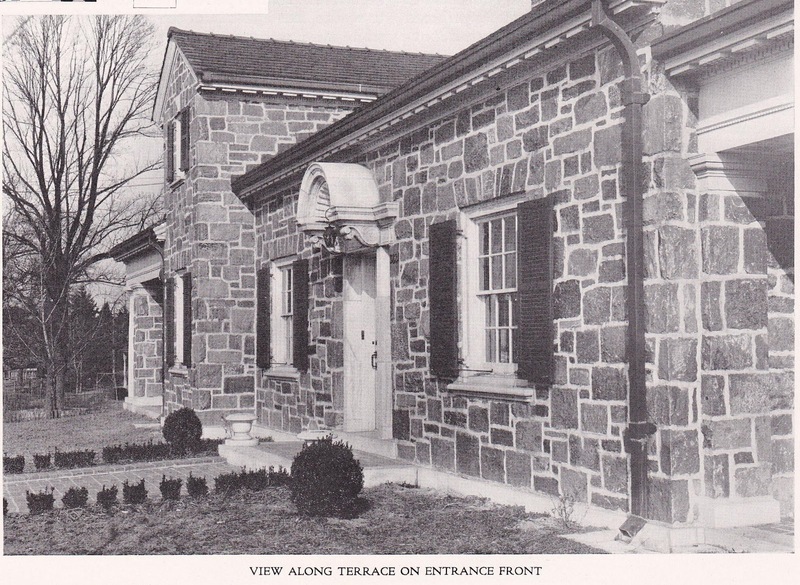 The modest brick house and barn were named North View, a foreshadowing of the eventual owner and use of the property by the US Naval Observatory. About 1851, the Barber’s replaced their farmhouse with a grand Italianate villa, just before the death of Cornelius in 1853. At the time, the estate included 73 acres, 15 enslaved persons, and 20 men in residence working the fields. Barber received compensation for her slaves in 1862, unlike her the majority of her neighbors, when President Lincoln signed an act for paid emancipation for District residents a full nine months before the Emancipation Proclamation was signed into law nationwide. Margaret Barber sold the farm to the federal government in 1881, and later died of influenza, in 1892. The lands sat vacant for some time, as plans were debated and additional lands acquired for the relocation of the US Naval Observatory from its prior location at 23rd and E Streets, NW. Founded in 1830 as the Depot of Charts and Instruments, the Naval Observatory is one of the oldest scientific agencies in the country. As a service organization, one of its first tasks was the calibration of ship's chronometers, which was accomplished by timing the transit of stars across the meridian. Scientists dropped balls at predetermined times from a pole on the roof, visible to ship captains stationed in the port. Construction on most of the buildings of the new Observatory began in 1888, designed by noted architect Richard Morris Hunt. 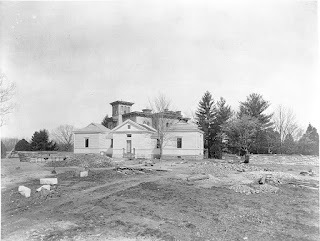 In 1893, the U. S. Naval Observatory moved to its present home there, and for the first time the Observatory had ample grounds to set up instruments far from the reach of city lights, smog, and vibrations from roadways. 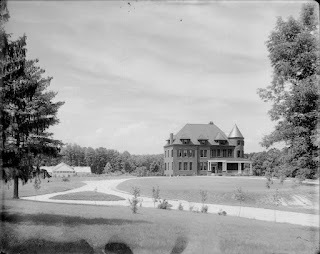 Several houses and duplexes were built on the grounds for personnel, along with a large house for its Superintendant, Frederick V. McNair, who served from 1890 to 1894. It was designed by Leon Emil Dessez (1858-1918). 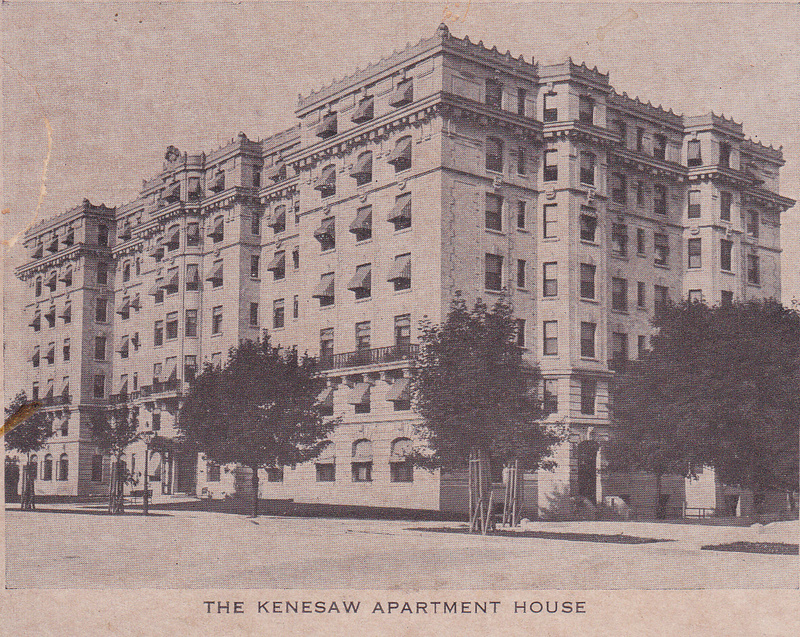 The Kenesaw Apartment building was built beginning in April of 1905 on a prominent triangular site atop a significant elevation at the corner of 16th Street and Irving Streets that allowed tremendous views of the city for its early inhabitants. It took its name from Kenesaw Avenue – now Irving Street – and it was fairly unusual in that it was built by a team of investors that intended to own and reside in the apartments for decades to come. It was also the second apartment building in Washington, following the Ontario, to be designed with all four sides acting as primary facades, each being constructed of Indiana Limestone. 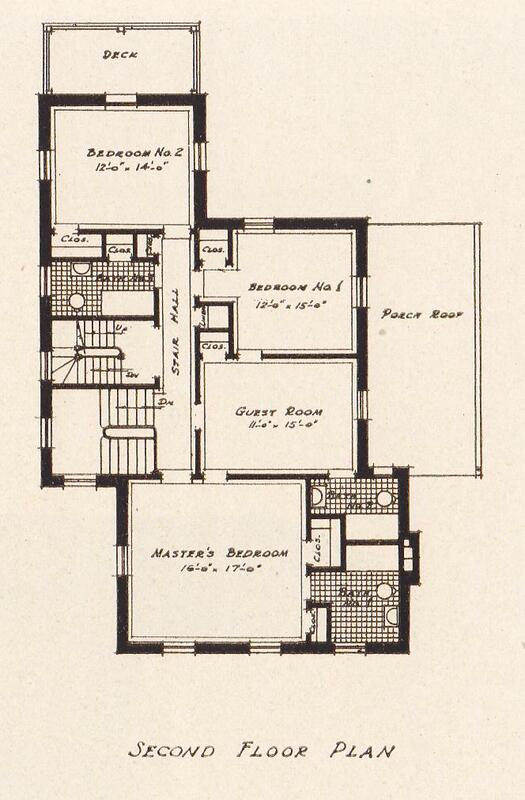 The apartment was designed in 1903 by the Averill & Stone, owned by engineer Frank L. Averill and architect George Winchester Stone, Sr., three years before construction began. It was delayed due to Congressional desire to have the prominent site taken by eminent domain to serve as a public park, in part to encourage the development of 16th Street. The seven original investors of the Kenesaw Apartment House Company, including former Senator John B. Henderson, lobbied Congressional members to allow construction, and in April of 1905, District Supreme Court Chief Justice Clabaugh ordered that a writ of mandamus be issued that led to the building permit that same month. 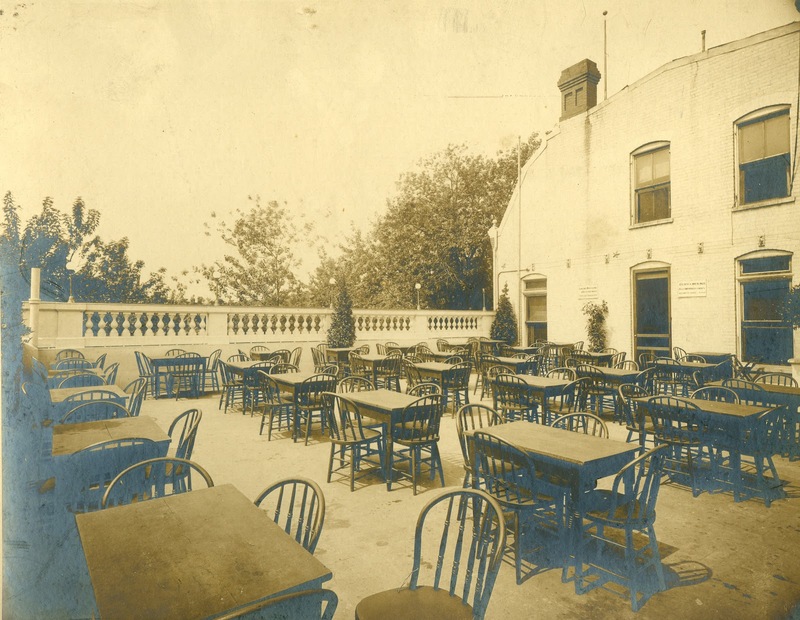 The Kenesaw was built with retail space on the ground floor for both tenants and future neighbors – the area was sparsely populated at the time – as well as the manager’s office with safe for valuables, gracious lobby, two public parlors, two dining rooms, and a large café. The building was built with 65 apartments; 12 efficiencies, 8 one bedrooms, 31 two bedrooms, and 14 three bedroom apartments. Just about the time a local Dupont bar owner was being subjected to intense scrutiny by the ANC for a possible expansion a few years ago, a reader of my Scenes of the Past column for the InTowner contacted me with fantastic pictures of a large bar once owned by his ancestor. The timing was perfect: who would have guessed that in the 1890s a bar with live music and over 200 outdoor seats existed right in the same neighborhood as one being protested today? History does indeed repeat itself, and often. Over 110 years ago, bar fights, liquor license protests, and yes, even lateral expansion of bars into adjoining spaces were all topics in the 1890s. Washington is not usually touted as a city of immigrants or industry, but it does in fact have a rich history of both; its history is often taught without any mention of breweries, bottling companies and beer gardens, but the truth is that in the 1870s and 1880s all Washingtonians could easily walk to a German-owned beer garden no matter where they lived in the city. 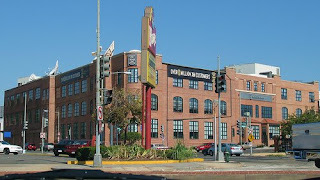 One of the largest and most popular of these was located at 1827 14th Street, in the heart of today’s U Street neighborhood, in a building where today people shop for upscale furniture. 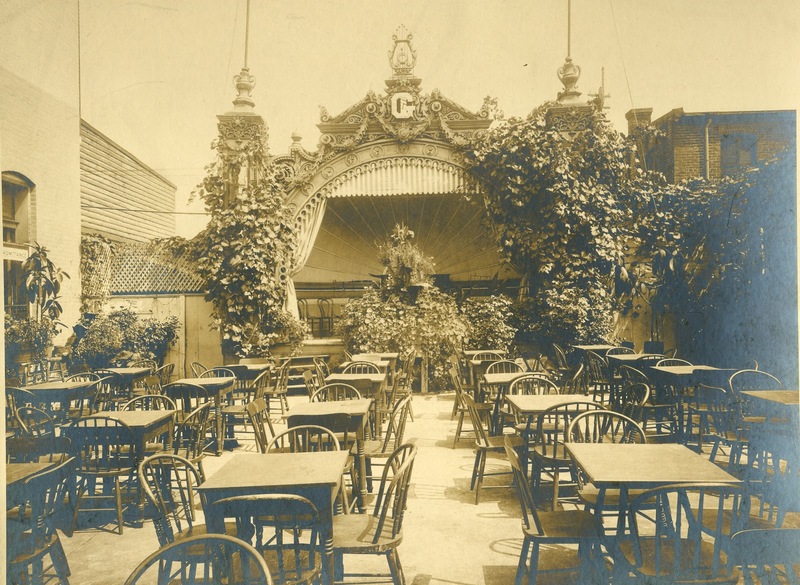 In 1897 — not 2012 — it seems that everyone in what was then an emerging neighborhood at 14th and S Streets drank at the saloon; that year alone, 1,700 of its patrons, men and women, signed a petition to keep what was then known as Kozel’s beer garden open and freely flowing with beer. Rooftop Garden with Band Stage. Copyright C Kozel. It was owned by German born George Kozel, who like many of today’s bar owners, faced continual pressure to close from those in the minority not willing to imbibe one of the many products of locally brewed beer. George Kozel’s father, John C. Kozel, had established one of the first known breweries in Washington in 1856, located at 9th and M Streets, NW. In 1861, he opened a brewery complex in Square 617, bounded by First, Second, N and M Streets, NW. It was an “extensive brewery and [he] commenced the manufacture of weiss beer,” according to his obituary. 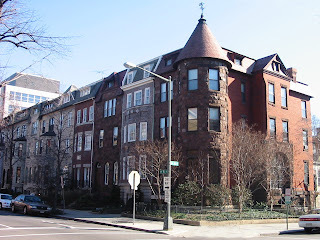 The complex also had a residence for the Kozel family at 43 N Street, NW. Stoneware beer bottles embossed with the name John Kozel are prized by collectors of breweriana today. John Kozel had been born in Württemberg, Germany in 1822, and immigrated in 1856 to the United States and to Washington, DC with his wife of eight years, Christiana, along with their children George, Paulina, and Caroline. Their youngest son, Charles, was born in Washington in October of 1858.Kozel joined the Union army in the Civil War, serving with Loeffler’s Company Militia Infantry, 8th Battalion, organized on April 11, 1861 in Washington for the defense of the city. 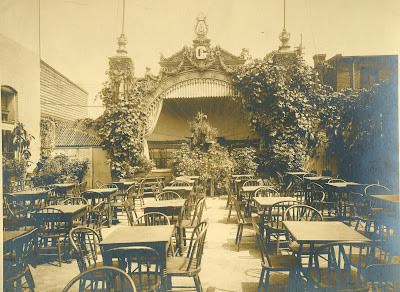 It was led by fellow brewer Ernst A. Loeffler, who owned a large brewery and beer garden next to the Kozel’s on land which is now somewhat ironically the New York Avenue Playground. John Kozel died on January 30, 1881, and was buried in Prospect Hill cemetery; his wife died in 1887. 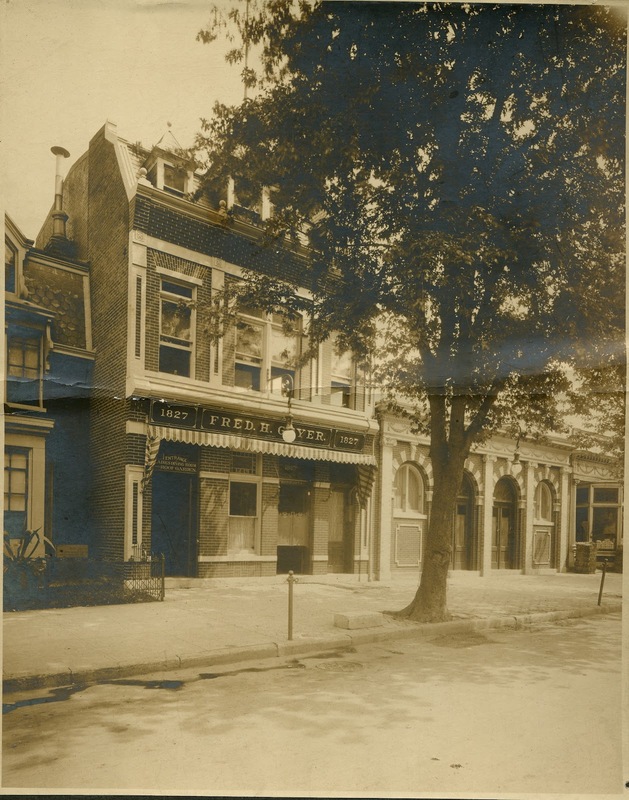 Their son, George Frederick Kozel, had joined his father’s brewery business, and by 1890 had opened a saloon at 1827 14th Street, between S and T Streets, NW, according to the City Directory. While I spent a few months on foot surveying the Tenleytown neighborhood in 2003 for a historical survey of the area, imagine my delight when an elderly homeowner had me follow them into an alley near 41st and Fessenden Streets, NW to show me a mystery marker. There, stuck between a cinderblock garage, a chain link fence, and a few errant trees was an original land boundary marker that had been there for 233 years or so at that point. Now that makes boring survey work not boring! I did a rubbing in July of 1770, and determined that it read “John Thrielkeld, Beginning August 1770.” Note: Surveying on foot had its advantages, unlike a firm in town commonly known as “Cut and Pasteries” that tend to do it from the safety of a car). The marker in upper Tenleytown certainly illustrated the vast size of land that was once owned by our John Threlkeld, (variously spelled Thielkeld) most of which is today’s Georgetown neighborhood. And history certainly repeats itself, as Threlkeld is credited with building the impressive Georgian mansion known as Quality Hill at 3425 Prospect Street that we documented and researched in 2009 for the current owners. It was built between 1797 and 1798 as a speculative real estate venture. 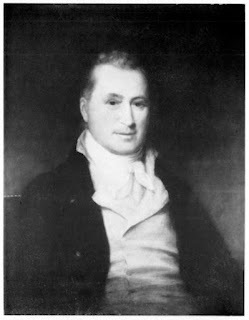 Threlkeld had been appointed the Mayor of Georgetown the year prior, and had earlier served as an Alderman upon Georgetown’s incorporation on December 25, 1789. Threlkeld and his wife Elizabeth were enumerated in the 1800 census nearby, on his estate coined Berlieth, on lands “once belonging to Montgomery County, Maryland,” today the site of the Convent of the Visitation. The Threlkeld family owned a vast amount of land, most of which composes NW Washington today. Interestingly, the pecan trees still extant in the convent garden today are offshoots of trees given as a gift from Thomas Jefferson to John Threlkeld when he married Elizabeth Ridgely. Berlieth was originally the home of John’s father, Henry Threlkeld, who had built it about 1753. 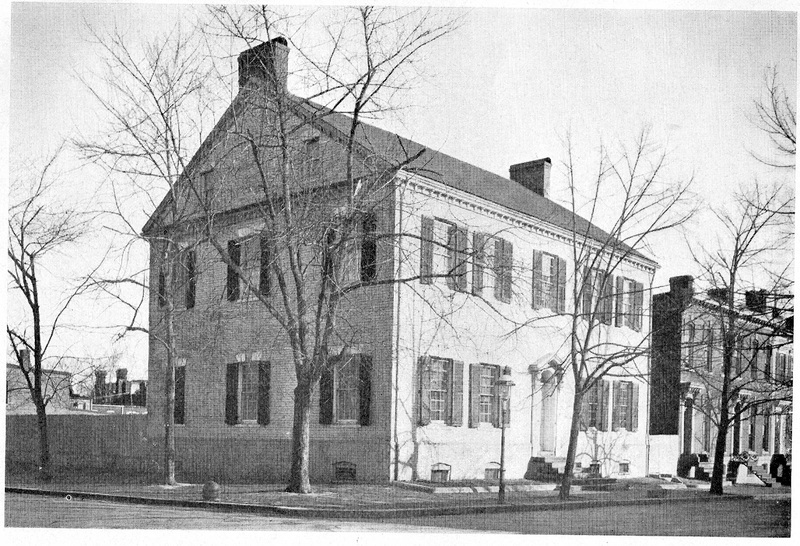 The original house was burned shortly after the Revolution, but another house was subsequently built. Henry Threlkeld (1716-1781) was an early settler from Cumberland, Maryland who bought Alliance, an estate of 1,000 acres bordering on the Potomac River. This tract, part of which came to be known as Berlieth (spelled variously over the years), extended north from the river to include the grounds of what is now Georgetown University, the Convent of the Visitation, and farther north to the present day neighborhoods of Burleith and Tenleytown. 3042 Q Street in Georgetown: Built in 1840 or 1940? 3042 Q Street: Built in 1840 or 1940, you decide! In some social circles, although nobody will admit it, the “oldest house” always wins. Homeowners like to boast about how their home is older than the neighbors, but some go to the extreme of mounting a plaque on the property with a construction date, which we find to almost always be incorrect. One such house in Georgetown at 3042 Q Street had a plaque stating the house was built in 1840, placed by a prior owner of our client: they wanted to know if it was accurate. The build date was indeed incorrect, and how! It was off by almost 100 years, in fact. It also boasted that the house was owned by an “R Bolling, a nephew of President Wilson. That was also apparently just made up. Imagine my trepidation when I presented the final house history – and proved that the house had been built in 1937, not 1840. That is right: the land on which it sits was vacant until a building permit was issued in July of 1936 to build the present house, albeit with resourced antique brick, moldings, fireplaces, and the like that has since fooled every prior homeowner (including our client). 3042 Q Street was built on property which had previously belonged to the Calvary Methodist Episcopal Church at 3038 Q Street. By 1936, all of the south side of Q Street between 30th and 31st streets had been developed, except for the westernmost twenty-foot strip of Lot 280 (which became Lot 819), west of, and adjacent to the Church and its parsonage at 3040 Q Street. In July of 1936, Alfred E. Lewis, Jr., a salesman for Shannon & Luchs Real Estate, bought this narrow parcel by assuming a debt owed by the church. He secured a permit to build a dwelling in the space between what is 3040 and 3060 Q Street. 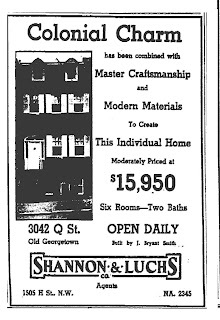 Although Shannon & Luchs did have a home building division at the time, it appears that the project was independent of his business. 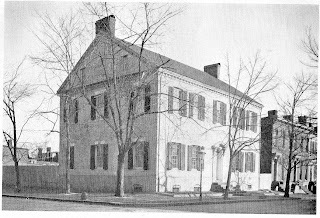 It was constructed on Square 1269, land which was part of Beall’s 1783 addition to the city of Georgetown. Although in the midst of the Great Depression, Washington metropolitan area home starts in the fall of 1936 had jumped 50 percent over the previous year. 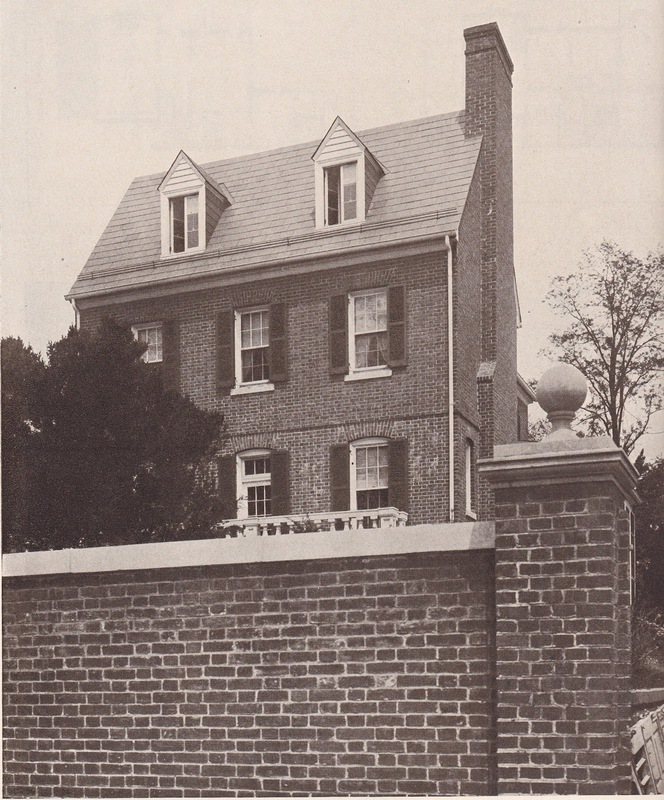 Because Lewis had to erect the house between two neighbors, he made agreements with them in September of 1936 to use their side walls to structurally support his own building. The floor joists were presumably seated in these existing walls. The house was actually built by contractor J. Bryant Smith based on a design by Robert T. Hafer. Lewis’s permit allowed for the construction of a two story brick dwelling at 3042 Q Street, with seven rooms, and estimated cost of the new structure at $8,000. As was the custom during the preservation craze in the 1930s, mostly thanks to Colonial Williamsburg, he apparently utilized salvaged building materials, including fireplace mantels and a multitude of arched doorway openings. 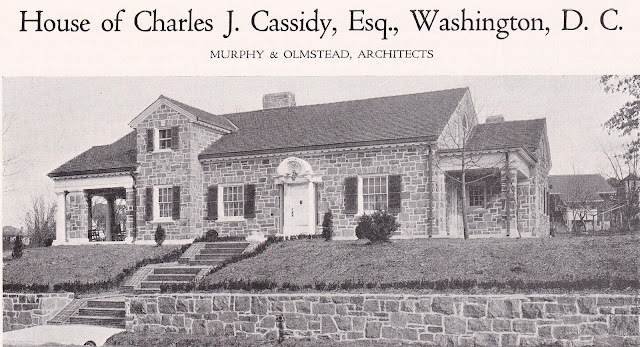 Nobody loves a good house history mystery more than yours truly, so you can imagine my delight when a Palisades neighborhood home owner called us about 15 years ago to report that they had found a Civil War cannonball in their yard while landscaping a new garden. That’s an interesting discovery for anyone! The house at 3027 Arizona Avenue, NW would prove very difficult to research, not because it was built in 1905, but because over time, it had not less than five very different street and address designations – which must be a record for any given house in DC. But back to the cannonball: we eventually discovered that it likely had been fired in the early 1860s from one of the two 100-pounder Parroti rifles located at nearby Battery Kemble. We researched a fascinating manuscript written in 1897 that described life in what is today the Palisades neighborhood was like during the Civil War, when it was dotted with rural farmhouses. It’s a long blog entry, and following the Civil War background and a bit about the five addresses it once had, we’ll investigate a bit of the house history itself, built by Otilia Crumbaugh in 1905 (below). 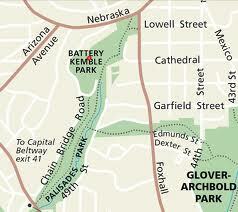 Located not far away from what is now the residence at 3027 Arizona Avenue, NW, was a Civil War encampment called Battery Kemble. 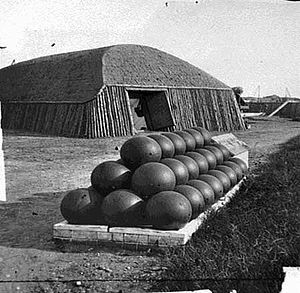 Only one of the 68 earthen forts and batteries which surrounded Civil War Washington, Battery Kemble was one of several heavy batteries which commanded the southwestern approaches to the city. Placed on the heights of the Palisades, these gun emplacements could defend against possible attack across Chain Bridge, the Aqueduct, the Potomac, or the C & O Canal. “All things being ready, we found ourselves in our new home on the last week in February, 1865. This was the Spring that Richmond surrendered, and the soldiers encamped around us inter­fered sadly with our farming operations. Near us on a high hill was a small earthwork known as Battery Kemble, and a small force of men was kept there all the time. When we were molested more than we could stand, we would send word to Lieutenant Libbey and he would send a guard and we would feel safe. He was a good friend, and when the news of the fall of Richmond and the surren­der of Lee’s Army came, and it was no longer necessary to hold the Fort, it was with sincere sorrow that we parted with this good friend. William W. Corcoran was well known as a philanthropist in early Washington society, with his name attached to many buildings, banking institutions, and the Corcoran Gallery of Art. One of his lesser known institutions, however, shunned publicity following its opening in 1871 as the Louise Home. Named after his deceased wife and daughter, the Louise Home was founded two years earlier, in 1869, for the comfortable maintenance and support of genteel yet impoverished ladies. William Wilson Corcoran was born in Georgetown on December 27, 1798, and during the long life time was known as a prominent banker, philanthropist, and art collector. His father, Thomas Corcoran, came to Georgetown in 1788 and established a leather business there that quickly became prosperous, and he was twice elected Mayor. At the age of 37 in 1835, W.W. Corcoran, as he was known, eloped with Louise Morris, who was just then age 16. 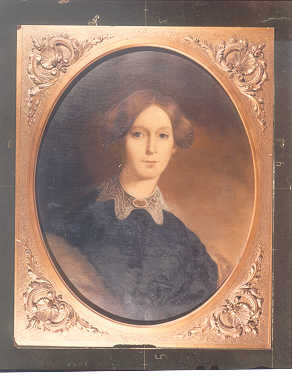 She was the daughter of Commodore Charles Morris, and died just five years later, in 1840. They had three children: Harriet Louise, Louise Morris, and Charles Morris. Sadly, only the middle child, Louise Morris (1838-1867), survived to adulthood. W.W. Corcoran never remarried. Corcoran had entered business at the age of 17, working in dry goods store owned by two brothers, and opened his own store two years later. In 1828, he took control of large amount of real estate from his father, and in 1837, established a brokerage firm on Pennsylvania Avenue at 15th Street. He was very successful and soon entered into a partnership with George W. Riggs. The firm of Corcoran and Riggs prospered and in 1845, they purchased the United States Bank located on 15th Street at New York Avenue, renaming it Riggs Bank. 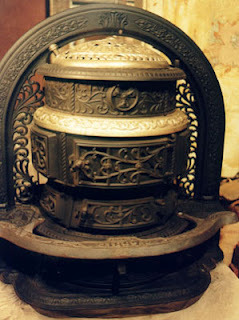 Thought Your Fireplace Heated Your House Long Ago? Think Again. Most Washingtonians enjoy a working fireplace in their older homes, but might wonder how it was able to heat the entire structure being as notoriously inefficient as they are. The simple fact is, they didn't. They were squat and round, about 20 inches in diameter at the base, and stood about two feet high. They fitted into a fireplace opening and burned coal, requiring a daily cleaning of a somewhat messy ash tray. There were 30,000 in use by 1878 in Baltimore alone!